Franklin Graham addresses the media in Tokyo, where he will preach the Good News this weekend. It's the fifth time he's preached in Japan in the last decade. This wasn’t breaking news exactly, but Franklin Graham wanted to drive home the message. Answering questions from about 30 Japanese media in Tokyo late Thursday morning, he addressed the statistic that less than 1 percent of Japan is Christian. “God loves the Japanese people as much as He loves any race,” Franklin Graham said. In fact, that’s at the core of why he traveled halfway around the globe to deliver this very Good News that anyone who puts their faith in Jesus Christ can have the hope of eternity. Could that day be this weekend? Beginning Friday night through Sunday evening, four events will give the 37 million people in the Tokyo metropolitan area a chance to hear the same message of hope that Billy Graham brought to the same venue — the Nippon Budokan — almost 50 years ago in October of 1967. The Japanese media largely asked questions about the message he intends to bring this weekend and if there are further plans to come back to Japan. 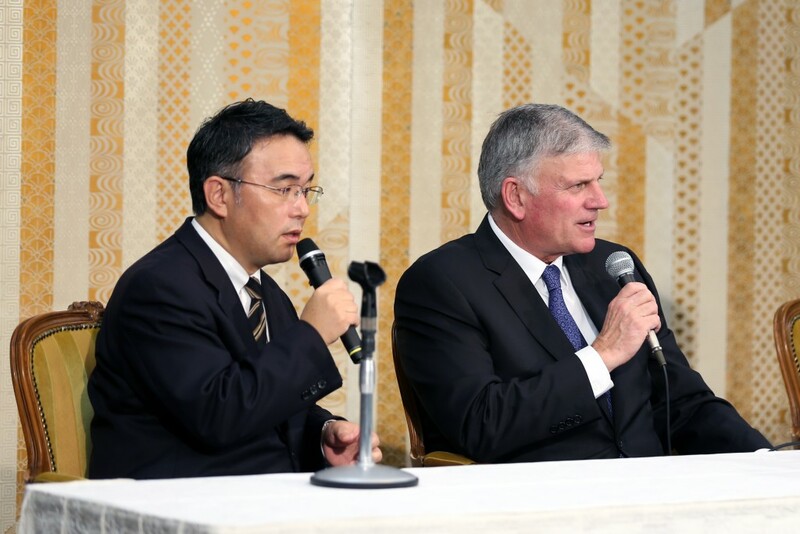 Outside of the United States and Canada, Japan is the country where Franklin Graham has spent the most time preaching in the past decade. He held outreaches in Okinawa in 2006, Osaka in 2010, Sendai in 2012 and Sapporo last May. And he hasn’t ruled out future outreaches in Japan, but he did explain that sometimes God has other plans for his schedule. 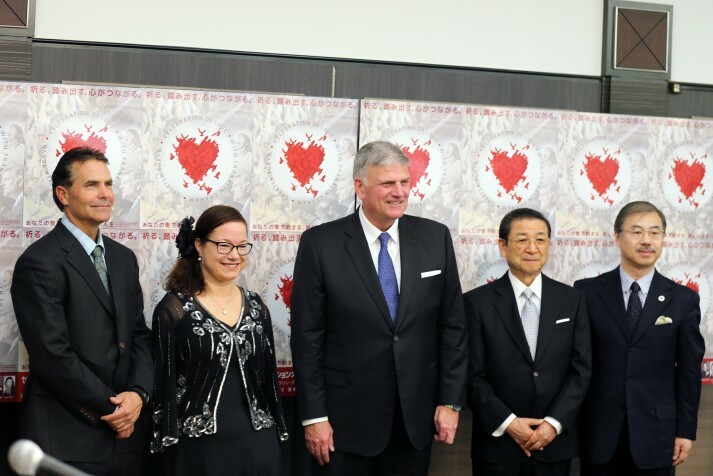 Franklin Graham (center) along with Trey Hillman (far left) take a moment for a couple pictures after addressing the Tokyo media on Thursday. Also addressing the media was Trey Hillman, former Kansas City Royals manager, who became a bit of a Japanese folk hero when he led the Hokkaido Nippon-Ham Fighters (in Sapporo) to its first Pacific League baseball title in 2006 and repeated it in 2007. Hillman, a strong Christian who will be giving his testimony on Saturday morning at the Budokan, is still in baseball, hired last October as the bench coach of the Houston Astros. He also came to Japan earlier in the year to help promote the event. The Greater Tokyo Celebration of Love takes place Nov. 20-22 at the Nippon Budokan, featuring Michael W. Smith, Lena Maria Klingvall, Hillsong Worship, a 1,500-member choir and much more.